How to obtain Trachycarpus 'Bulgaria'? The beginning, or how happened that palm trees grow in Bulgaria. Like many other important things, it was discovered by accident that palms could ever survive in Bulgaria. Before the winter in 1973 the staff at the historical museum in Plovdiv have decided to no longer bring inside the four heavy palms that they have had in the garden. So they just left them outside. To their surprise the palms were alive in spring. The palms were planted in the ground. One could determine how small they palms have been during that time by looking at the space between them. They are very close to each other, but there also plants of Thuya orientalis in between. 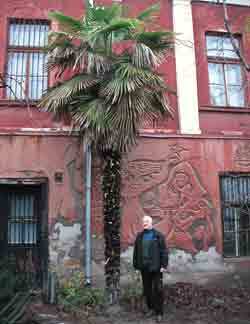 Obviously it was never expected that palms could grow that tall in Plovdiv. On the picture below is one of the palms that has been planted separately and the man (Christo)who planted them in the ground back in 1973. At that time nobody knew what palms are these palms. We know today that they are Trachycarpus fortunei. No one could ever supply any reliable information about their origin. But according to the Ph.D. thesis of Dimitar Kozarov he has proved that their offspring has improved cold hardiness. During the following 10-15 years several new palms have appeared in other locations, and there is a reliable information that they come from the palms in Plovdiv. The locations are Kresna, Black sea coast, Sliven, as well as more palms in Plovdiv. A palm of great importance to our story is the biggest one in Nessebar. It is well known to the public - it grows almost in the end of the new town on the main road, direction to the old town. Unfortunately the palm has now more than 7m of trunk and is not easily visible from the road anymore - it is just too tall. Even the other 2 palms growing there for the last 20 years have grown quite tall. The big palm comes from seed, brought from Sochi, Russia. The smaller palms are from the Exotic plants research station at the Sunny beach resort. This station doesn't exist anymore. At the Exotic plants research station at the Sunny beach resort they have proved the excellent cold hardiness of the offspring of the four palms in Plovdiv. They started experiments with small seedling from the Plovdiv palms. During the first years only female palms flowered and they used pollen from the big male palm in Nessebar, the one from Sochi. Thousands of small seedlings were produced. They were offered for free to the cities along the Bulgarian Black sea coastline. All were planted in public parks and along the streets but, for less than a year all of these small palms were stolen. Now you can spot older Bulgarian palms here and there in private gardens. Only four palms remained. Why four? I don't know. Why remained? Because they were planted in front of the police office at the Sunny beach resort. These palms are now huge magnificent plants and are still there, never protected. Unfortunately, after the changes in our country is not possible to produce palms to give away for free to public or private persons. But it has started and the offspring of these palms are now world wide famous. The content of these pages is under protection of the copyright laws!